Bradley Cooper’s A Star Is Born reminds us that clichés exist for a reason—because they embody a whiff of universal truth that can hit us right between the eyes when it becomes our reality. This latest remake of a perennial Hollywood story doesn’t offer many new insights, but it reaffirms what we know—or what we think we know—about relationships, artistry, the trappings of fame and the demands of the entertainment industry. Its comforting familiarity is both its greatest limitation and its appeal—there are certain songs we love hearing over and over again, and A Star Is Born’s tale of “making it” is one we apparently never tire of. As you watch this new movie, you feel like you’ve known its contours all your life. Cooper, who makes his directorial debut and also co-wrote the adaptation, stars as Jackson Maine, a roots-rocker of considerable popularity. But not all is right with the man: Tinnitus is robbing him of his hearing, and his addiction to drink and drugs is becoming worrying to those around him. One night after a show, he goes looking for a bar, stumbling upon a performance from Ally (Lady Gaga), who belts out an impassioned rendition of “La Vie en Rose.” Jackson is captivated by this aspiring singer-songwriter. She tells him she’s been told she’s not pretty enough to make it in the music business. He tells her she’s beautiful. A Star Is Born quickly throws these two mismatched souls together, as Jackson brings her onstage at his next sold-out show to duet with him on an arrangement he’s put together of one of her songs. The performance goes viral. Ally suddenly is in huge demand. The two become lovers. You know every word by heart. Cooper sets up an intriguing tension within his film, wanting to offer a thoughtful, relatively realistic look at the music business while simultaneously going for the big emotional moments and can’t-miss dramatic beats. His A Star Is Born acknowledges the clichés of its setup while asserting that there’s something eternal and cyclical about their underlying tenets. Yes, we’ve seen all manner of stories about fading stars, rising stars, the toxicity of ego and the struggle to balance career and romance—but it’s because the system itself is built to perpetuate these clichés, tricking hungry, naïve young talents into thinking they can somehow sidestep the traps that have ensnared so many artists before them. The predictability is part of these characters’ tragedy. The movie exudes a melancholy air, even when things are going great for Jackson and Ally. We know what awaits them, even if they tell themselves otherwise. And as bad times descend upon them, A Star Is Born begins to reveal one of its central truths, which is that performers create art to counteract their pain—but that the pain still remains, touching everyone in their path, never fully dissipating. For Jackson, that pain is an unhappy, complicated childhood—Sam Elliott plays his much older brother—while Ally battles feelings of inadequacy that she’s always going to be an ugly duckling who never becomes the swan. Neither their musical success nor their love affair will heal those wounds, but they pursue both anyway. What else can they do? Gaga gives a lived-in performance as this working-class gal who suddenly finds herself embedded in the life she never thought she’d have. As Ally ascends the ladder of pop stardom, Gaga’s instincts kick in—she’s a dynamic presence—even if sometimes her more dramatic moments can be wobbly. But she has a warm rapport with Cooper, who alters his voice to play Jackson. The Oscar-nominated actor sports a mumbling growl, as if the character’s tales of hard living have worn away his ability to adequately communicate. The affectation doesn’t entirely work—you hear the effort involved—but Cooper has no illusions about Jackson’s flagging career or tempestuous personality. Jackson is a mean drunk, and he’s susceptible to jealousy, even while he wants the best for Ally. Cooper makes those contradictions touching without ever allowing them to be noble. But for every nice small observation and delicately detailed bit of emotional truth, A Star Is Born is, in a larger sense, trapped by its own construction. Yes, it can be quite moving—but it’s moving precisely how you might imagine it would be. 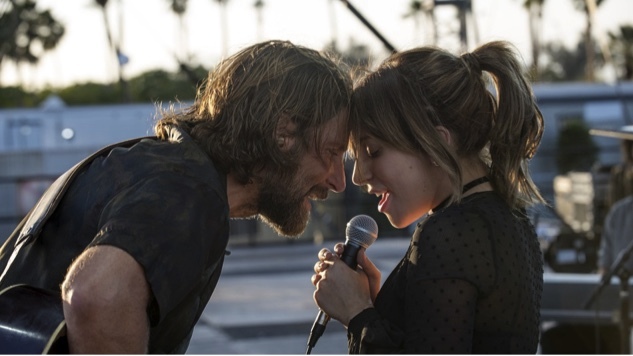 And undoubtedly Cooper and Gaga are communicating something heartfelt about their experience as celebrities in our media-saturated age—but what’s personal to them about the material can’t always save the movie from feeling like a well-turned cover song. A Star Is Born is a good show. But it’s not blazingly original or truly transcendent. We hear the echoes of what came before.